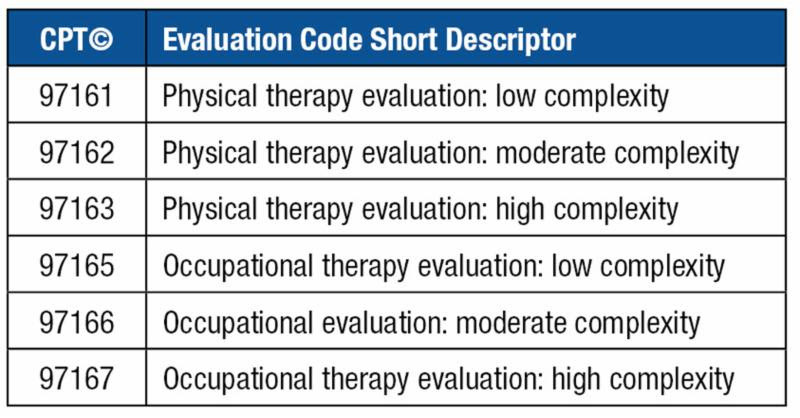 New evaluation codes for physical therapy (PT) and occupational therapy (OT) codes were made effective 1/1/2017. Three new physical therapy evaluation codes replaced 97001, and three new occupational evaluation codes replaced 97003. The PT and OT reevaluation codes remain the same but were renumbered in the sequence with the new PT and OT evaluation codes as 97164 and 97168. The change from a single evaluation code for both PT and OT to tiered codes that are somewhat similar in nature to Evaluation & Management codes (E&M) may be confusing. Therapists and coders who review documentation and select the appropriate tiered code are often not clear on the elements and criteria for determining proper code selection. Auditors that review therapy documentation for the purpose of audit, investigation and/or claim adjudication are mistakenly making determinations based solely on time. 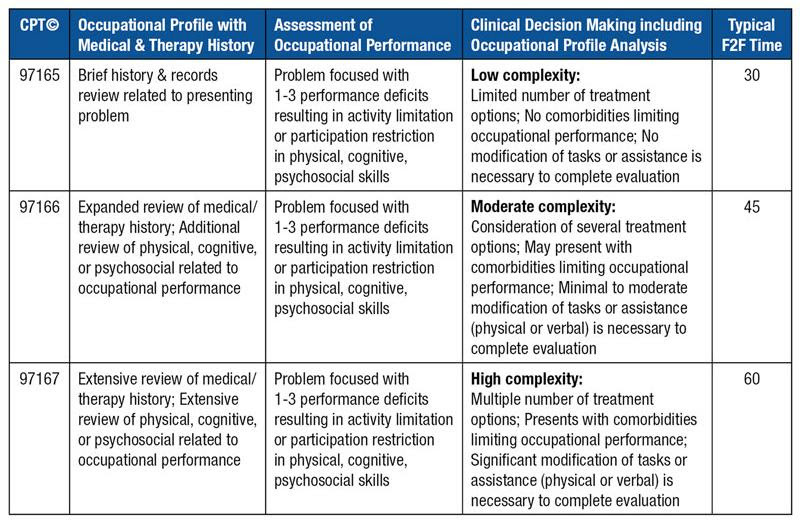 Therapists working in multidisciplinary settings are often not clear on the difference between the PT and OT evaluation criteria. Therapists often admit that they base their code selection on time. Q1. 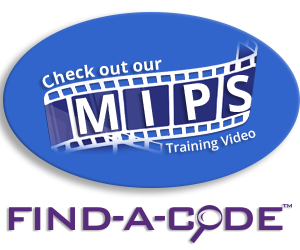 Are the therapy evaluation codes E & M codes? Q2. How is the time component computed in determining code selection? Q3. Do all the elements of the code have to be at the same level? A3. All requirement of code must be met. For example, if a patient presents with multiple personal factors and comorbidities, and the evaluation addresses 1-2 body systems, with moderation decision making for the plan of care, but has a stable clinical presentation, the code selection would meet low complexity, rather than moderate complexity. Q4. Are the same criteria used for PT and OT code selection? Below is a summary chart of the training materials generally used by the therapy organizations in rolling out coding education. [iv] Chart 2 contains criteria for the use of the PT evaluation codes, Chart 3 contains criteria for use of the OT evaluation codes. The body systems review for physical therapy evaluations include cardiovascular/pulmonary, integumentary, musculoskeletal, and neuromuscular. The body structures include structural or anatomical parts of the body organs, limbs and components classified according to body systems. Body regions include head, neck, back, lower and upper extremities and the trunk. The level of clinic decision made through the use and interpretation of standard patient assessment instruments and measurement assessments of functional outcome. For further insight into the PT and OT evaluation codes, review your favorite CPT coding reference book. Both the American Physical Therapy Association[v] and the American Occupational Therapy Association[vi] have provided references on their websites. [i] CPT Assistant, August 2017. [iii] Occupational Therapy Practice, Framework: Domain & Process, 3rd Edition, AOTA, 2014.